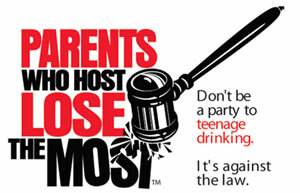 The Waupaca Police Department reminds everyone that Parents Who Host Lose the Most: Don’t Be a Party to Underage Drinking. The coalition is working with police and community groups to provide parents with accurate information about the health risks of underage drinking and the legal consequences of providing alcohol to youth. The campaign encourages parents and other responsible adults to clearly and directly remind family members and close friends that allowing teenage alcohol consumption is illegal and unacceptable. It is illegal, unsafe, and unhealthy for anyone under age 21 to drink alcohol. Allowing underage youth to drink alcohol in your home endangers everyone’s children. Together, as a community, we are all saying hosting or allowing underage drinking is unacceptable in Waupaca. We’ll be cooperating with police efforts to identify and prosecute those who sell and serve alcohol to youth. Underage drinking isn’t a “grey area” of the law. If it illegal to purchase, pour or provide alcohol for anyone under age 21 who isn’t your child or spouse. Other parents can’t provide “permission” for you to serve their kids alcohol. Adults who think taking car keys away when providing alcohol to youth are placing both the youth and their financial future in jeopardy. Alcohol related drowning, falls and suicides kill hundreds of teens each year. And most homeowners’ insurance policies don’t extend liability coverage for illegal activities. If you purchase, pour or provide alcohol for youth; you put your financial future at risk. Host safe, alcohol-free activities and events for youth during prom and graduation season. Refuse to supply alcohol to children or allow drinking in your home or on your property. Be at home when your teenager has a party. Make sure your teenager’s friends do not bring alcohol into your home. If youth bring alcohol into your home, confiscate it immediately. Talk to other parents about alcohol-free youth events. Unity creates a tough, enforceable message. Report underage drinking to authorities promptly.